← Help … I Can’t Get Out of the Water! I’ve still got that list going in my little notebook – “Things I Want to Write About” and it still has plenty of items on it that want my attention. And as my time in Cambodia begins to wind down (How could it be? Say it isn’t so! ), I’m reflecting on all the words that haven’t yet been written to describe my time here and the myriad of ways I’ve been affected by being in this country. 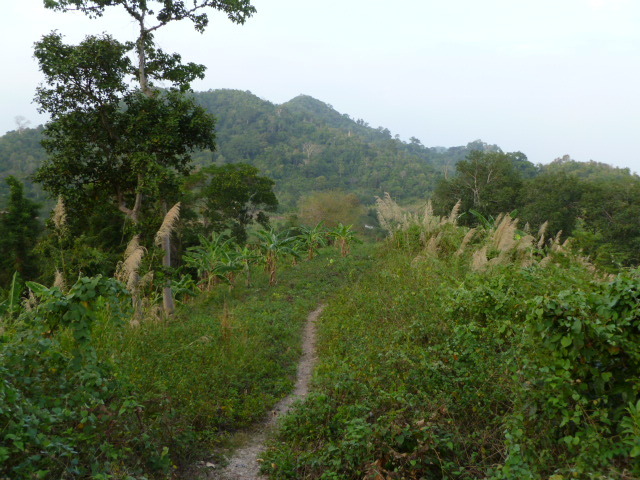 I am now in my new guest house, Botanica on the outskirts of Kep. I just arrived less than an hour ago and since I’m quite a ways out of town, I thought I would explore town later (I’ve got 4 full days here!) and take time now to relax and write some – what a good idea! My bungalow is a simple cement structure with a palapa-style roof. It’s got windows on two sides, which helps with air flow and a small tiled lanai, complete with two chairs and yes, a hammock – the true symbol of chillaxing – when’s the last time you lost track of time in a hammock? There are just six bungalows here with lots of banana trees, yucca plants and dense foliage that reflect its name – it’s certainly got a botanical garden kind of feel to it, pretty familiar to my Hawaii home. At $8 it’s a fine deal – the restaurant comes with rave reviews and that communal area is a large, palapa-roofed, open air spot that’s comfy and just a stone’s throw away from my bungalow. I may stay here for my entire Kep stay or see what I see when I wander around town. Most places are not in town, but out in the rural countryside, down in valleys and out in the middle of meadows – much to be explored, but later, later. I’ve heard about a place down the road with a pool and a dorm room, so I’ll check that out for sure. For now, this is fine and I’m glad to be in a place where I can comfortably write and relax. My time is indeed winding down here in Cambodia. Kep is my final stop before crossing the border at Ha Tien into Vietnam. For some reason, I have this feeling that Vietnam is going to be a big change to where I’ve been thus far … not sure why I anticipate this – it may be due in part to the very strong reactions it elicits in fellow travelers – I’ve met only two people who speak of it with fondness – everyone else had strong negative opinions, ranging from feeling ripped off at every turn, to feeling like everyone was out to ‘get them,’ some of whom did. I will have my own experience, of course, and form my own opinions. For now, Cambodia still has me and I have nothing but positive and pleasant experiences in this country. 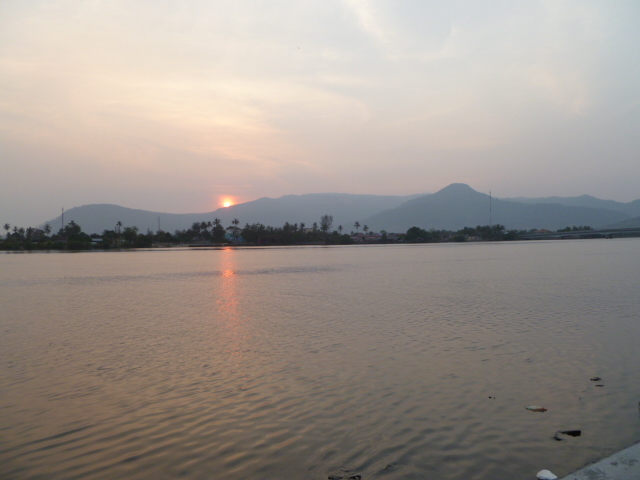 Like last evening – I strolled into the downtown area of Kampot along the riverside for my last evening there. While I really enjoyed Kampot, I was not as enamored as it seems many people are – I’ve already met other foreigners who had planned to come for a few days and that was months and years ago. Kampot is undergoing a huge renaissance and the ramshackle French colonial villas that are scattered all over town are slowly being bought up by foreigners (yes, foreigners can buy here with some savvy know-how and a trustworthy Khmer connection) and wealthy folks from Phnom Penh who are refurbishing them and bringing new life to this charming riverside town. It has a quality unique to what else I’ve seen in Cambodia – people even friendlier (if that’s possible), locals and expats frequenting the same places (very unusual) and a focus on cleaning up the place that many other Cambodia villages and cities could learn from. 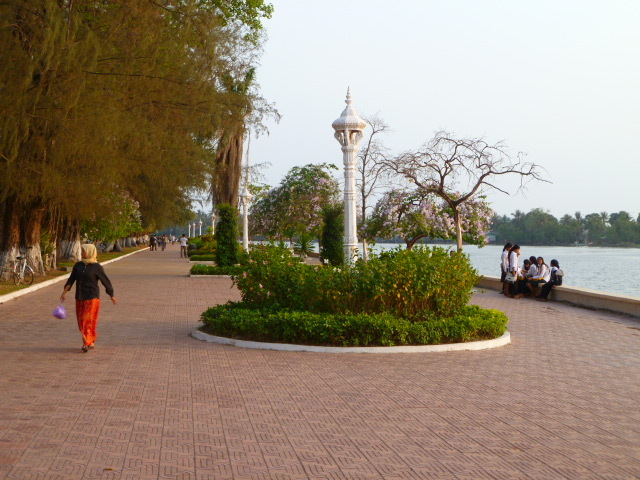 I imagine big changes will continue to come to Kampot; and now that they’re almost done with the beautiful riverside promenade, I hope they focus on cleaning up the river some more – it’s really quite an atmospheric place as the sun sets over the mountain that sits off in the distance. Back to my evening last night – I found my way to Jasmine Restaurant, which I had seen several times in my wanderings and decided on for dinner earlier in the day. 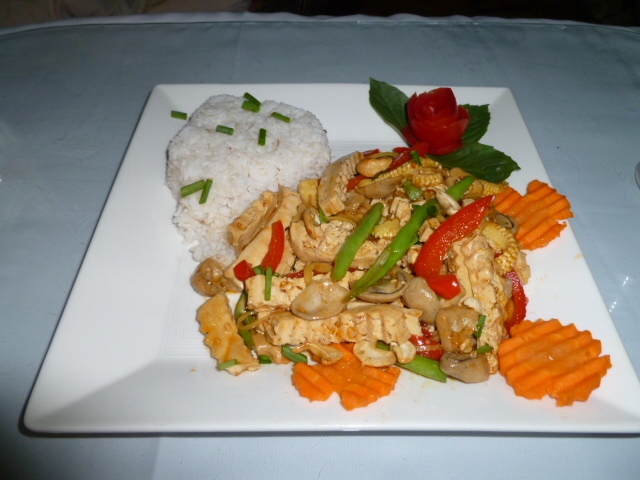 The staff was incredibly welcoming and beguiling with that ever-present Khmer smile – and my dinner was divine! An appetizer of sweet potato and ginger spring rolls and the main course of stir-fried tofu and veggies, also with plenty of ginger, along with garlic and a yummy secret sauce – I’ve been eating tons of dinners like this, but the flavors of this one and the sweetness of the staff made it one of my best dinners in the country. Enter Jasmine, the owner – she sat with me as I ate and we proceeded to enjoy a wonderful conversation. Her daughter and husband came and went throughout our talk, but she and I shared a few hours of an exceptional evening. Her English was excellent as she’s been working for an NGO for the past 16 years and has learned English through their education work together. Her husband is a Californian and they have an adorable 3-year old daughter. Before long, we were in a lengthy political discussion of the situation in Cambodia, the lives and roles of women and how she is moved to be a part of the change she sees as so desperately needed for the women in her country. She spoke to me about Mu Sochua, a woman who is currently in the Cambodian Parliament and who is considered the most prominent woman challenging the status quo in Cambodian politics and is also the leading oppositional voice to the current political regime (which sadly sounds dictatorial and a remnant of the Khmer Rouge days – the Prime Minister was actually part of the KR and has been in power since that time – no chance of the people standing up in revolt against him, though, Jasmine said – they are uneducated and too fearful to upset the peace, even though their lives of poverty continue on mostly unabated. I’ve heard this refrain before in Cambodia, but we said the same thing about Egypt, Libya and Bahrain and I say, anything’s possible!). Mu Sochua left Cambodia during the Khmer Rouge days, went to the United States to receive her education and got her MSW at UC Berkeley! She returned to her country with a determined passion to make a difference here and has been doing just that ever since. She lives part-time in Kampot and is quite the rebel rouser with the Prime Minister. She’s been threatened with arrest and death and yet she persists. I was thrilled to learn about her, to hear of Jasmine’s personal relationship with her and to get an insider’s understanding of life here in Cambodia. As our time together began to wind down, a foreigner sitting in the restaurant chimed in and said, “So, did you sort things out with your passport?” “What? Am I already known in town for the woman who lost her passport? !” Turns out he was at the bar Mans and I went to the other night where there was a party going on – he had been lip-locked with his new girlfriend, so I didn’t get much of a look at him that evening, but he clearly remembered me. We had a nice chat, too – he had lived and worked on Otres Beach for many months, he knew Mans and Arie and is one of those people who couldn’t quite leave Otres and Cambodia. There seems to be a run of these folks. It was a lovely evening of fabulous food, sweet connections and a further education about life here in Cambodia. I even had time to go home and write – it doesn’t get much better than that! My days in Kampot had an easy, relaxed quality to them – I wandered around town, sat in cafes for hours and walked, walked, walked. As I was walking and before Mans arrived that first evening, I met a foreigner on the street who told me of a sailboat cruise taking off the following morning and since it was their first sail and a re-con to test the boat and the route, they were offering it to whoever joined them for free! I was somewhat skeptical (there’s no free lunch and all that jazz), but I showed up the next morning to check it out. Sure enough, the story remained the same – they didn’t want any money – they were going anyway and encouraged me to come along – what could I do but say yes?! No other such takers, though; it was me and five Cambodian men, all in their 20’s & 30’s. 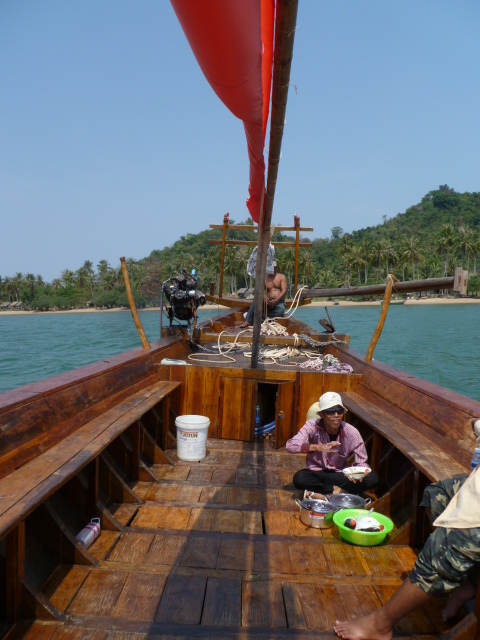 We spent the entire day boating, first motoring out to three islands, had a fantastic lunch of a shrimp sandwich and coconut shake on one of them, a great swim and then we sailed back to Kampot. We saw dolphins, plenty of sea birds and loads of fishermen (yes, all men) making they way back into town. It was a loooooong day in the hot sun – seven hours – but I was thrilled for the experience, for being willing to trust (that they weren’t going to cut my body up into little pieces and distribute it throughout the islands!) and for the delight of going with the flow! The next morning I made my way to the local market to stock up on the first souvenirs of the trip – the famous Kampot pepper. Yes, Kampot is known for its white, red and black pepper and it’s featured on every menu, not only here in town, but country-wide. I decided pepper would be a fun thing to bring home and as I wandered through yet another market, filled with the bustling, crowded scene of Khmer people selling and buying everything from toothpicks to chickens, clothes to deep-fried crickets, unidentifiable vats of peanut-butter-looking stuff to huge bags of rice, to hanging carcasses of dead cows to beauty products – sometimes with these things smack right up against each other – I found my way to the pepper stalls and the negotiations began. It was pretty low key and the price reasonable enough that I didn’t bargain hard – after sometime, I left a satisfied customer with two kilos of pepper! The small shops in town sold tiny bags of the stuff for 10 times the price. Even Norm back at the guest house told me he sold pepper, but went to the market as I did, bought it there and then turned around and sold it to the travelers. Ever the finagler, I am! No nice, fancy bags, but I figure I’ll procure some of those in California and make up some sweet little gifts of the spicy stuff! 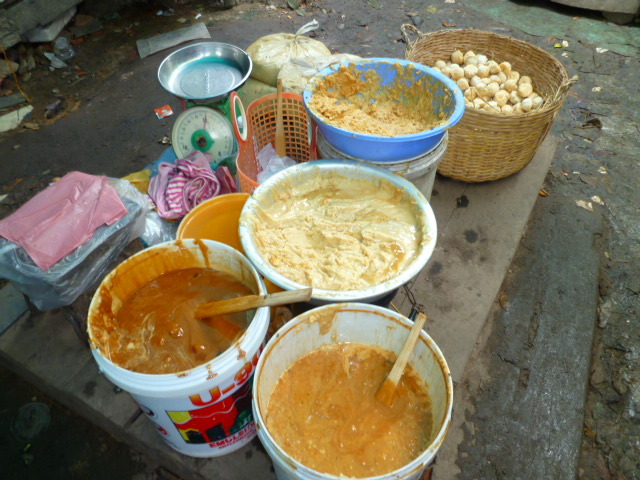 No idea what this is - the makings of peanut sauce maybe?! With no interest in schlepping or adding two kilos to my backpack, I checked in with Norm about the possibility of shipping a box to the States – we jumped on his bike to the Post Office, along with not only my sack of pepper, but another sack of stuff I decided I didn’t need anymore. While now I wished I had done a bit more shopping to be able to send home some goodies to my sister, that will have to wait until later in the trip in Vietnam and again in Lao, where I understand shopping is amazing and sending things back is also a breeze. Having lightened my load (and my wallet by way too much, even for a slow boat! ), the people at the Post Office boxed everything up and sent me on my way. As always when I’ve sent stuff from my travels, I wonder if I’ll ever see it all again – but I’ve never lost a box and there’s no reason to think it’ll be any different now! I bid my adieu to Kampot and to Norm, who was a friendly Brit turned Aussie turned expat, living here in Kampot for close to 10 years. We enjoyed some good chats, he helped me out with various errands and we enjoyed some good laughs. I enjoyed his story about his travels through Vietnam some years ago and how he got to work on the set of The Quiet American as Michael Caine’s stand-in – he proudly showed me the magazine articles and all – quite the travel tale! I’ve got four days left before my Cambodian Visa expires and my Vietnam Visa begins and I’ll spend all that time right here in Kep – another small village undergoing a renaissance – it was formerly the playground of the rich and famous and while I haven’t seen any of it yet, I will certainly wander down to the seaside if for no other reason than to partake in Kep’s specialty – crab and the famous Kep Crab Market. While my diet has become practically completely vegetarian, I’ve begun to eat a bit more fish lately and I simply won’t be able to resist crab, one of my favorites! I’ve enjoyed taking animals out of my diet and have had almost no dairy out here as well. While I’m not interested in labeling myself a vegetarian (labels of almost any kind choke off my air supply! ), my diet certainly seems to be! I’ve been writing now for two hours and still, I haven’t gotten to a thing on my “What I Want to Write About” list – yikes! I think it’s time for a break and some lunch here at Botanica. Hopefully after this break, I’ll begin to check off some of these topics that have been long neglected! Well, no luck getting through my list – now it’s 11 pm and I’ve just returned to write after a full, unexpected day. During my lunch here at Botanica, I started chatting with some folks who had been walking around the grounds earlier today filming – I needed to know what was going on, of course and they gave me the low down – Jo & Stuart, a couple of friendly, 20-something ‘kids’ from London town who decided to come to Cambodia for their second trip and do some footage interviewing people about their experience with the Khmer Rouge. In the process of their travels, they discovered Kep Gardens, a training center with an English school, a trade school and a hospitality school. They were so impressed with what the folks at Kep Gardens are doing that they have spent the last few weeks getting to know them and filming their work. I enjoyed hearing their experiences and impressions; and before we knew it, we were off for a hike to the Kep National Park. The afternoon hike was extraordinary – several miles hiking up and through the Park with lots of birdlife and expansive views up the mountain and out to the sea. It was a perfect introduction to the rolling hills and the gorgeous green countryside that is Kep, some of the prettiest I’ve seen anywhere in Cambodia. The best way to spend the late afternoon! It was getting dark by the time we came down and we decided to head right to dinner at a place we had all heard about – Breezes Restaurant – it hardly lived up to its reputation, but with our table just a few feet from the lapping shore, the ambience was beautiful. It’s rare that I pay attention to restaurant reviews, but this one sounded so outstanding. There were several plates on the table and none of them were close to outstanding. But we enjoyed the company and conversation – everything from Khmer Rouge stories to travel tales to not understanding how people back home can be so uninterested in hearing our stories when we return. It was all good fun – easy and comfortable. We only just returned to Botanica an hour or so ago and have been hanging out here with Stefaan, the Belgian owner who is quite warm and welcoming. I introduced myself as I took my seat at the bar — “ohyeah, Christina, I was just talking about you today!” – “Huh?” – “Ohyeah, I just hung out for awhile with Norm in Kampot.” – Gee, this place is like Puna – everyone really does know everyone and I’m getting in the mix quicker than I could imagine! I got a little taste of the ‘downtown’ area as we headed home in our tuk-tuk – a beautiful promenade all along the waterfront, the famous Crab Market and the very small beach area – I’ll check it all out tomorrow. 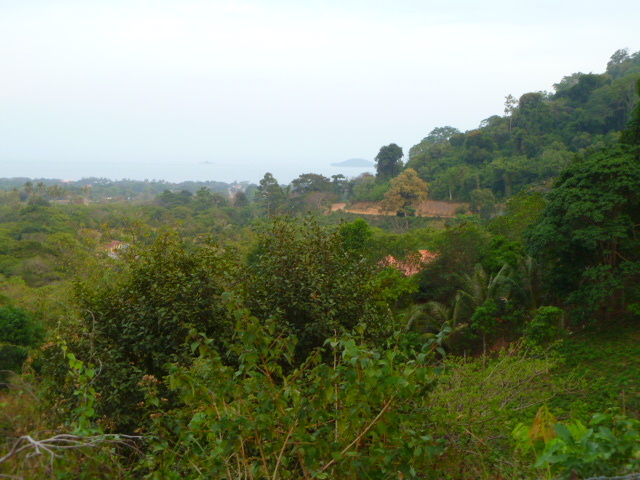 But what I do know is that there’s not much here in Kep – it’s a small, sleepy place and that’s part of its charm – gives me that much more time to spend more time writing. Ohyeah, and getting to that list that still hasn’t been tended to even in this post! Ohwell, it will have to wait for another time! Now it’s time to lay the body down and give thanks for yet another sweet day of travel! This is such a beautiful post – I’m so grateful that you’re blogging your adventures. I really needed to read this tonight. Thank you. Thanks, Amy – glad you enjoyed! It’s so fun for me, too, to share the journey with friends back home – thanks for being part of the circle! Kep sounds like a wonderful place! After all the crowded place Kep is my paradise. Fried crab with green papers makes my mouth watering. (many, many more lines than this – this is just an example.) Maybe it’s because you are typing with a different keyboard, I don’t know. But thanks for stopping by anyway! Oh my goodness, please don’t apologize for writing in your language – that’s what we all do! I only wish I could understand it! Thanks again for stopping by – oh yes, I am enjoying my travels – I have come to love Cambodia and the incredibly wonderful Khmer people, of whom I’m sure you are one! Thanks for all the warm words, thanks for loving us. 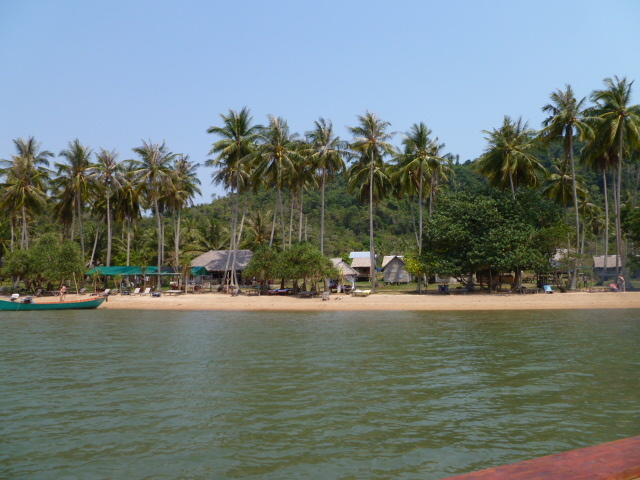 My family live at the rural area which far northeast (Kratie Province) and they have dolphins there. Maybe you are interested you can take some days to explore more about Cambodia, of course if you have time. wow….you really *are* making your mark there….you’ve got the locals reading your blog!!! Sad to say I am leaving Cambodia today – could DEFINITELY spend more time here – perhaps on another trip. Warm greetings and yes, Samnang La Or to you and your family!